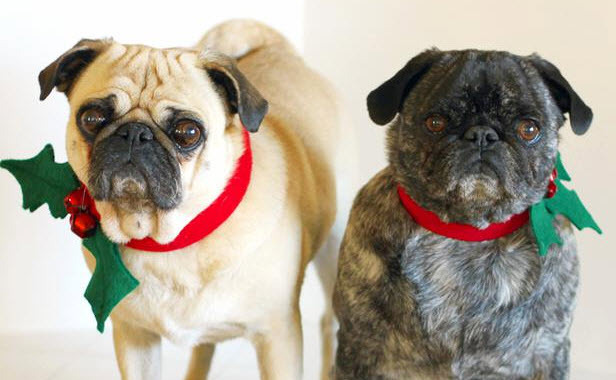 Sew a festive Christmas collar for your dog! Measure your dog and cut a piece of red fabric to the length needed for the collar with extra width. Fold the collar in half lengthwise and sew the folded edge in place to create a tube of fabric, leaving a tiny bit unsewn on one end. Cut a piece of elastic to the size needed, thread the elastic through the red fabric tube and sew the ends of the elastic together. Fold the unsewn part of the red fabric tube inward and sew the ends of the tube together. Cut the shape of holly leaves out of a piece of green felt, sew one end of each leaf onto the collar and sew bells onto the collar between the leaves.